How could the US bombings affect Donald Trump and Hillary Clinton’s chances? A number of explosions and near-explosions in New York, New Jersey and Minnesota might influence the presidential race. It always seems ghoulish to look at events involving injury and death through the lens of a political campaign. But with just seven weeks until the United States elects its new President, the question of how attacks in New York, New Jersey and Minnesota at the weekend might affect the outcome is one that can’t be avoided. On Saturday morning, a pipe bomb exploded in a rubbish bin in Seaside Park, New Jersey. Fortunately, no one was hit: runners in a charity race avoided injury due to a delayed start. Twenty-nine people were injured in New York City that evening, however, by a pressure cooker bomb. Further devices have since been found in the New York area, but have been removed without casualties. Nine people were also injured at roughly the same time in a shopping mall in St Cloud, Minnesota. They were the victims of a young man with a knife, who was himself shot and killed by an off-duty police officer. Naturally, Clinton’s response was more measured and reality-based. She condemned “the apparent terrorist attacks”, prayed for the wounded and their families, and praised “the bravery of our first responders who run toward danger to help others”. She also took the opportunity to highlight her proposals to improve intelligence, resources and training to prevent attacks. In an interview on Fox & Friends on Monday morning, Trump claimed that the solution was to stop people entering the US, to encourage police officers to use racial profiling, and to “hit them much harder over there”. So how will the attacks – and the candidates’ responses – affect the race for the White House? The race is currently close: Clinton leads by about two points nationally, and has a 60 per cent chance of victory to Trump’s 40 per cent, according to FiveThirtyEight’s models. Even if just a few per cent of voters change their minds following these events, it could change the outlook significantly. In the Republican primaries, Trump seemed to be a beneficiary of terrorism. He saw his poll numbers rise following the attacks in both Paris and San Bernadino late last year. However, that doesn’t necessarily mean that the recent attacks make Trump more likely to become President. In fact, despite Trump’s bravado, polls suggest that voters prefer Clinton when it comes to keeping them safe. A Fox News poll last week found that 47 per cent of likely voters trust Clinton to do a better job on terrorism and national security, compared to 46 per cent for Trump. It also found Clinton leading 50–45 on immigration. Given that she trailed Trump 44–51 on the economy in the same poll, Clinton may prefer issues like national security and immigration to have greater salience as we head towards the election. A Washington Post-ABC poll earlier this month also found Clinton leading Trump on the issues of terrorism (47–44) and immigration (49–44), though this time she also led 50–44 on the economy. However, a CNN/ORC poll found Trump leading 51–46 on the question of who would better handle terrorism. Again, though, this was considerably lower than his 56–41 lead on the economy. Clinton also held a substantial 56–40 lead on who would better handle foreign policy, as well as a small 49–47 lead on immigration. Overall, these national poll findings suggest that Trump would probably have the best chance of winning in an election focused more on the economy than on national security, terrorism and immigration. Indeed, his poll numbers did not improve following the Brussels bombings in March or the Orlando nightclub shooting in June – when there was a greater focus on terrorism. 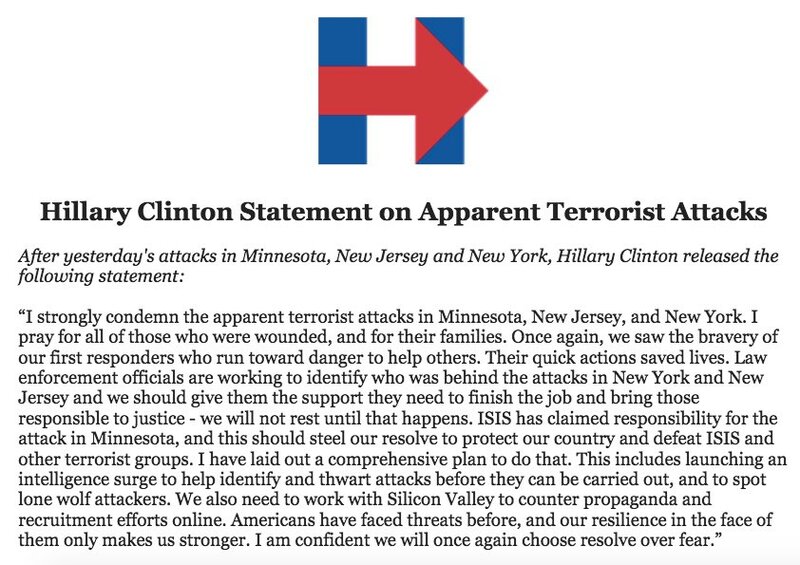 None of this allows us to say with certainty how the weekend’s attacks will affect presidential race. Views on which candidate would best protect the nation are not set in stone: they can, and will, be shaped by the responses to these attacks and by future events – including the upcoming debates. Those debates will pit Hillary Clinton’s foreign policy experience, in-depth understanding of the issues and meticulous preparation against Donald Trump’s tough guy act and “knock the hell out of them” vacuity. The choice should be a clear one. Jonathan Jones writes for the New Statesman on American politics.